Fascinating is the word in a nutshell that perhaps best describes this past season. With 2009 looming, the time has come to reminisce as to why 2008 was such a quintessential year for the ATP. The abundance of talent littering the tour foretold of a possible shake up as the year began, threatening Roger Federer’s supremacy. All dynasties have gone through a period of decline; perhaps, for Federer, 2008 will be viewed as such. In Australia, Federer faced two foes, mononucleosis and Serb Novak Djokovic. Unable to vanquish either, Roger succumbed in the semifinals. For Federer, this calendar had many ebbs and few flows with a spanking by Spaniard Rafael Nadal in the French final, a gut wrenching loss in the Wimbledon final in five sets, a much desired gold medal at the Olympics, but in doubles. Roger regained a bit of respect by capturing his fifth consecutive U.S. Open. But, for the first time since the dawning of the Federer era, Roger failed to grab a single masters’ shield. In 2008, not only did the Swiss have to get acclimated to the fact that Wimbledon was no longer his playpen, he also lost his grip on the number one ranking. What a year for Nadal! Undoubtedly talent is an important part of success, yet hard work cannot be discounted. As the season started, the smart bet would have been on Djokovic yanking the top spot from Federer. Nevertheless, Roger’s clay nemesis, after more than two years of serving as best man, finally moved up to number one. After crushing defeats in the quarterfinals in Australia and finals at the Sony Ericsson, Nadal had a surreal clay run with one solitary loss. Moreover, Rafa won his fourth consecutive French Open and the crown jewel, his first Wimbledon trophy. He was the first man in over twenty years with this dual combination. The ultimate feather in Rafa’s cap was getting Olympic singles gold. An arduous and lengthy schedule put the breaks to Nadal’s play with tendonitis stopping him from participating in the year-end tournament and the Davis cup finals. Regardless, Nadal could not have scripted this year any better. In many respects, Djokovic had an up and down ride. After hoisting the Australian and Indian Wells trophies, the world number three had a reality check. Nadal unwilling to relinquish his hold on number two, schooled Djokovic when the two met in Rome and Paris. His confidence slightly dented, Novak was a non-factor mid-year with an early exit at Wimbledon. However, Djokovic finished strongly by winning the year-end tournament in Shanghai. Several youths realized their promise in 2008. The 19 year-old Argentine Juan Martin Del Potro leapt from 81 to 9 after surging in the second half of the season. The teenager had won four consecutive titles prior to running into Britain’s Andy Murray in the quarterfinals at the U.S. Open. Furthermore, Del Potro secured Argentina’s place in the Davis Cup final by crushing Russian Igor Andreev in the decisive rubber match. After severing his ties with coach Brad Gilbert, Murray flourished. The Brit reached his first major final at the U.S. Open, claimed two masters’ shields and ended the year ranked number 4. Croatian giant Marin Cilic showed he has skills and a brilliant future with his initial title at the Pen Pilot tournament. Another 19 year old, Japanese Kei Nishikori beat James Blake as a qualifier in the finals in Delray for his first ATP trophy and finished the year ranked in the top 70. The French legion was a formidable force this year with two fresh names producing many special moments. Jo-Wilfried Tsonga blew away much higher ranked opponents, including compatriot Richard Gasquet, to book a spot in his first majors’ final in Australia. Although injury temporarily sidetracked him in May, Tsonga won a riveting match against Argentine David Nalbandian in Paris to take his first masters’ shield. Gilles Simon also excelled this year, beating Federer twice at the masters in Toronto and Shanghai and playing a superb semifinal against Nadal in Madrid to get to his first masters’ final. Tsonga and Simon capped their year ranked sixth and seventh, respectively. Showman Gael Monfils demonstrated that he might be prepared to punch in the court time needed to live up to his talent. Monfils reached the semifinals of the French Open, going from number 38 to 14. For American tennis fans, there was little rejoicing in singles play, particularly at the majors, where no man advanced past the quarterfinals. At the French and Wimbledon, the U.S. was given an early return ticket. Although Andy Roddick and Blake continue in the top ten, their careers are tumbling backward. The former was stopped at the quarterfinals at the U.S. Open, while the same fate befell the latter at the Australian Open. Twenty-seven year-old veteran Mardy Fish had his best season with a finals appearance at Indian Wells after thumping Federer in the semifinals. Also, Fish had his best showing at a major with a quarterfinal finish at the U.S. Open. Sam Querrey, the 21-year-old Californian, came into his own. Querrey won his first tour title in Las Vegas and gave Nadal all he could handle at the U.S. Open. In doubles, number one also changed hands as Mike and Bob Bryan’s reign ended. At the majors, Israeli Jonathan Erlich and Andy Ram took the Australian, South Americans Pablo Cuevas and Luis Horna the French, Canadian Daniel Nestor and Serb Nenad Zimonjic Wimbledon, and the Bryan brothers the U.S Open. Nestor and Zimonjic dominated the year-end tournament to capture the trophy and number one ranking. Spain, minus Nadal, comprehensively defeated Argentina to capture its third Davis Cup this decade. Swede Jonas Bjorkman bowed out after a spectacular doubles and an honorable singles career. Former French Open champion Brazilian Gustavo Kuerten, affectionately know as Guga, officially said his farewell. While the USA network bid its own goodbye to tennis after several years of broadcasting the U.S. Open. The gambling scandal that shadowed the tour was resolved, with Russian Nikolay Davydenko absolved of all charges. 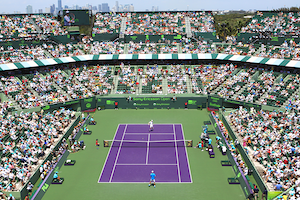 The ATP took on the task of restructuring its calendar which will be debuted this coming year. For 2009, a host of issues will be cleared. Chief among them is whether Nadal will be able to overcome his pesky injuries. Otherwise, the Spaniard’s stint at number one will be limited. In his last two tournaments, Federer himself was bothered by a back problem. Moreover, Roger’s forehand was often shaky in 2008. The question is whether both will recover, allowing Roger to regain his past glories. Djokovic, separated from Federer by only ten ranking points, and Murray are tired of being the men in waiting and want to ascend to the throne, will either one succeed? Undoubtedly, the wealth of youthful talent on the ATP will make it difficult for anyone to assert a stronghold on the top as Federer had done for 4 ½ years. I suspect that 2009 will prove as compelling a year as the one that just passed and it will be intriguing to see who will finish as top dog.